In Tibetan Buddhism the Tai Situpa is one of the lineages of tulkus, reincarnated lamas, in the Kagyu school. According to tradition, the Tai Situpa is an emanation of the bodhisattva Maitreya, who will become the next Buddha, and who has been incarnated as numerous Indian and Tibetan yogins since the time of the historical Buddha. The title Tai Situpa, or more completely Khentin Tai Situpa means «far-reaching, unshakable, great master, holder of the command». The holder of this title is also called Situ Rinpoche and Tai Situ. Traditionally, the Tai Situpa was considered to be the third highest ranking lama of the Karma Kagyu sect, after the Karmapa and the Shamarpa. However, in 1793, the Shamarpa was stripped of his properties by the 11th Dalai Lama and forced underground, effectively making the Tai Situpa the second highest lama in the Karma Kagyu. The current and 12th Tai Situpa, Péma Tönyö Nyinjé, was born in a farming family in 1954 in the Palyul district of Dérgé, in the East of Tibet. At the age of five he left Tibet for Bhutan, where King Jigme Dorji Wangchuk had been a disciple of the 11th Tai Situpa. Later he was cared for at Rumtek Monastery in Sikkim, India where he received religious instruction from the 16th Karmapa. The 16th Karmapa had himself been raised under the guidance of the 11th Tai Situpa. Indeed this alternation between teacher and pupil for the Karmapas and Tai Situpas from the 1st Karmapa and on serves as a mechanism for continuity within the Kagyu tradition. 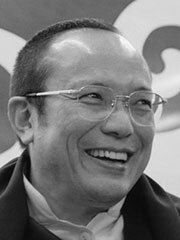 At the age of twenty-two, Situ Rinpoche founded his own new monastic seat, Sherab Ling in Himachal Pradesh, in Northern India. He traveled widely making his first visit to the West in 1981 to Samye Ling Monastery in Scotland. The 12th Tai Situpa was instrumental in recognizing Urgyen Trinley Dorje, one of two young men claiming to be the 17th Karmapa. Chokyi Gyaltsen was the first incarnation to bear the title Tai Situ, conferred upon him in 1407 by the Yongle Emperor of China in the Ming Dynasty. He was a close disciple of the 5th Karmapa who appointed him as abbot of Karma Goen, the Karmapa’s principal monastery at the time.